The idea is using ‘easy to understand’ codes for visualizing certain kind of information. In this particular case we have the smallest administrative boundary with information regarding population for the country of Spain: ‘secciones censales’ (1). 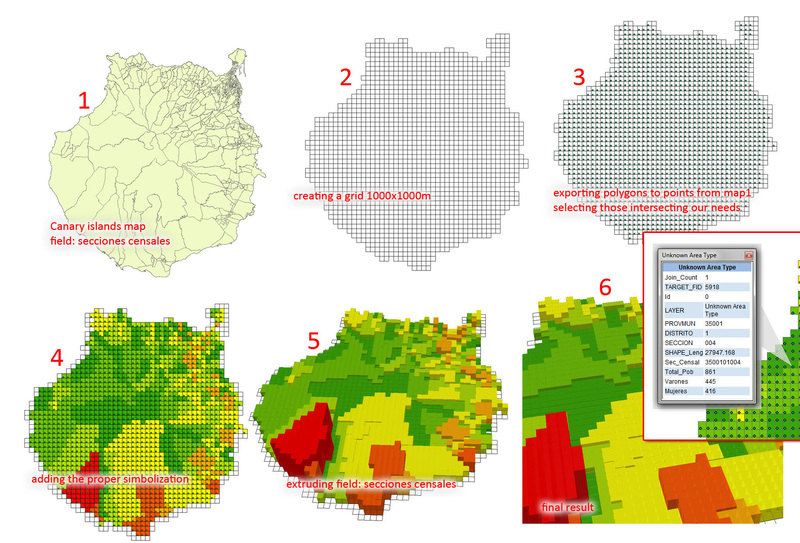 We also have a 1 sq km grid where we are going to link that information to (2). Once we spatially link that information (3, using ArcGIS 10 in this particular case) we proceed to symbolize it. This is not trivial at all, color codes, number of classes, proper extrusion scales are KEY to understand the information we are trying to show… (4, 5 and 6). 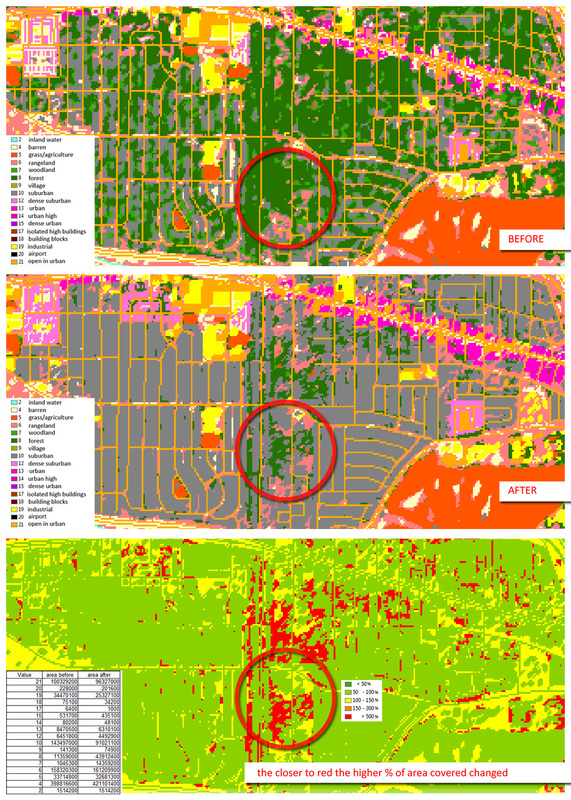 Please take a look at this interesting document about proper symbolization using ArcGIS. The first visual shows the first stage of the process, lets say we have classified this clutter in i.e year 2010 and these are the classes and their distribution. The second visual shows a second classification, the same classes should be used, that’s pretty logical. The third one states which classes have more variation in terms of area. For instance Forest figures vary from from 43.000k to 11.000k sqm so more than 500% variation thus classified as red colour. For this purpose i use ARCGIS and the table information. I calculate geometries to know the exact area of every class, i also summarize and make some simple % calculations to figure out the results. Having made this i also use simbolization to express the easiest way possible what i want to show. A very quick way of flagging anything.